(TORONTO - January 11, 2011) The Art Gallery of Ontario will mount the first major museum retrospective of artwork by renowned Canadian artist David Blackwood, whose dramatic narratives, set in the harsh landscape of Newfoundland, celebrate the resilience of native Newfoundlanders. Black Ice: David Blackwood Prints of Newfoundland, on view from February 5 through June 12, 2011, showcases highlights of the gift of 242 archival prints given by David and Anita Blackwood to the AGO in 1999. "David Blackwood is one of Canada's most recognizable and treasured artists," says Matthew Teitelbaum, the AGO's Michael and Sonja Koerner director, and CEO. "His works are profound depictions of the struggle for survival between humans and nature, and the AGO is thrilled to be celebrating his remarkable achievements by exhibiting so many fine works from our preeminent collection of his prints in this landmark exhibition." Organized by Katharine Lochnan, Senior Curator and The R. Fraser Elliott Curator of Prints and Drawings at the AGO, Black Ice features 70 prints spanning 40 years of Blackwood's career. The exhibition also includes letters, photographs, a ship model, nautical artifacts, flags, and historical maps from the artist's collection. It provides an in-depth view of Blackwood's 1980 masterpiece Fire Down on the Labrador that includes preparatory drawings, the original etched copper plate, trial proofs, and final impressions. "I first encountered the etchings of David Blackwood in the late 1970s and was riveted by them," says Lochnan. "He has made an unparalleled contribution to Canadian visual culture by creating an iconography of Newfoundland which resonates even more strongly with the passage of time." A film program will screen inside the exhibition and includes recent documentary footage of Lochnan and Blackwood in Newfoundland discussing his work, Rex Murphy's interview with the artist for CBC's The National, and the National Film Board's 1976 Academy Award nominated documentary "Blackwood". The exhibition will occupy a series of galleries on the fourth floor of the AGO's Vivian & David Campbell Centre for Contemporary Art. This spring, the AGO's contemporary tower will be entirely devoted to the work of influential Canadian artists of the 20th century, with Paterson Ewen: Inspiration and Influence, organized by Teitelbaum, occupying the fifth floor galleries from February 8 through May 22, 2011, and Betty Goodwin: Work Notes continuing on the fourth floor alongside Black Ice until April 24. A book, also titled Black Ice: David Blackwood Prints of Newfoundland, will be published to coincide with the opening of the exhibition. The 224-page volume, edited by Lochnan, features 115 colour plates and an international, interdisciplinary approach to Blackwood's works, including essays by Lochnan, geologists Derek Wilton and Martin Feely, historian Sean Cadigan, folklorist Caoimhe Ní Shúilleabháin, art critic Gary Michael Dault, and novelist Michael Crummey. Black Ice ($40) will be available at shopAGO beginning February 5 and is co-published by the AGO and Douglas & McIntyre. Visitors aged 25 and under will be able to visit Black Ice free of charge until April 3 if they take advantage of the AGO's offer for under-25's to visit Maharaja: The Splendour of India's Royal Courts for free. The offer is generously supported by the Patrons of the Exhibition: Fairfax Financial Holdings Ltd., The Globe and Mail, Rogers Communications Inc., and Scotiabank Group. AGO members will be invited to an exclusive advance preview of Black Ice on February 2 from 10 am to 8:30 pm. Members receive unlimited free admission to the exhibition, among other discounts and benefits. More information on AGO membership can be found at www.ago.net/membership. 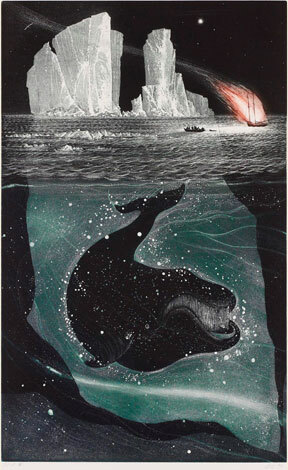 Black Ice: David Blackwood Prints of Newfoundland is generously supported by Salah Bachir & Jacob Yerex, John & Joyce Pollock, Samuel & Esther Sarick, and an anonymous donor. Contemporary programming at the AGO is supported by the Canada Council for the Arts. The AGO also acknowledges American Express, Signature Partner of the Contemporary Collection Program and BMO Financial Group, Signature Partner of the Canadian Collection Program. David Blackwood is one of Canada's most respected visual storytellers. Born in Wesleyville, Newfoundland and educated at the Ontario College of Art, his work has been exhibited nationally and internationally with over 90 solo shows and scores of group exhibitions. His work can be found in virtually every major public gallery and corporate art collection in Canada, as well as in major public and private collections around the world. He was made a member of the Order of Canada and 1993 and the Order of Ontario in 2002. In 1999, Blackwood and his wife Anita gifted 242 archival prints to the AGO, making the Gallery the international research centre for Blackwood's artwork. He currently resides in Port Hope, Ontario.